When remodeling period homes, we always take a holistic approach with the new design by incorporating elements that evoke the period’s feel, but that are updated for today’s living. 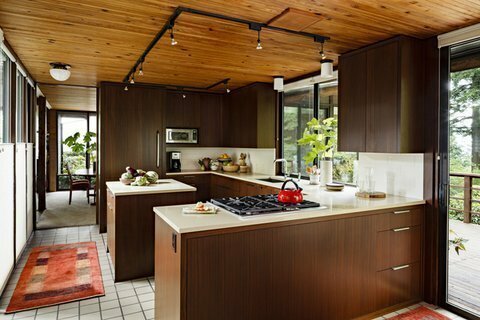 This particular kitchen was originally designed by architect Saul Zaik, one of Portland’s original modern home designers. 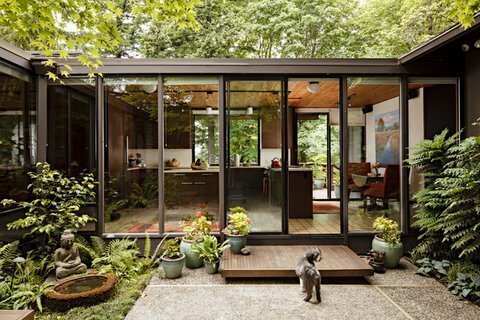 Built in 1962, the home was designed to sit back in the trees and take in the native landscape. True to his design style,this home is organized into (3) separate “pavillions”: the living and kitchen workspace, the children’s area and the adult area. The kitchen had white painted cabinetry, dark, heavy track lighting and the island was nearly 5′ high, which blocked the incredible view of the courtyard. 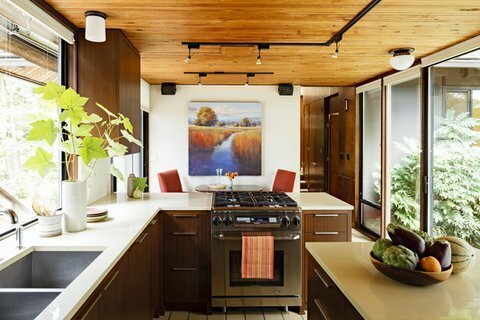 Now, the sapele mahogany cabinetry, updated lighting, countertops and plumbing fixtures all lend a simple modern touch while still preserving the original charm. Mid Century Modern design is characterized by Post and Beam construction, allowing for open floor plans with large expanses of glass. This style also is known for integrating the indoor spaces with outdoor surroundings. This kitchen with it’s walls of windows and courtyard that can be viewed from most of the central living areas, puts the newly remodeled kitchen center stage. This home has been selected to be on of the five featured homes on the Architectural Heritage Society’s “Heritage Home Tour”, Saturday, July 28th 2012.